PDF of the entire issue (12.44 Mb). (pages 2-4): For every year since its founding in 1983, TWAS can point to significant accomplishment. Sometimes there are momentous events, and at others the impact results from the steady accumulation of excellent work by the members, affiliates and other researchers who are a part of our global family. 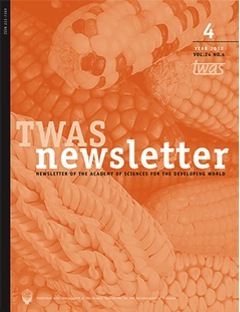 (pages 5-18): At the close of his second term as TWAS president, the Brazilian mathematician reflects on the Academy's impact – and on the need to do more. (pages 9-12): New research shows that in both developed and developing nations, women are not full partners in the knowledge economy. And the economic effects can be profound. (pages 13-15): How will science build the strength to address hunger, disease and other global-scale challenges? One student at a time, says Mohamed H.A. Hassan, TWAS’s former executive director. (pages 16-21): TWAS is headquartered in Trieste, Italy, along with a number of other science centres. In September 2012, the city held its first ‘Trieste Next’ celebration bringing scientists from around the world together with 30,000 people. TWAS interviewed two speakers, Roger Beachy, a pioneer in plant biotechnology, and Nick Davidson, a global authority on wetlands preservation. – This is the interview with Roger Beachy. (pages 22-25): TWAS is headquartered in Trieste, Italy, along with a number of other science centres. In September 2012, the city held its first ‘Trieste Next’ celebration bringing scientists from around the world together with 30,000 people. TWAS interviewed two speakers, Roger Beachy, a pioneer in plant biotechnology, and Nick Davidson, a global authority on wetlands preservation. – This is the interview with Nick Davidson. (pages 26-27): TWAS had asked everybody associated with TWAS – members, affiliates, alumni and winners of TWAS prizes, fellowships and grants – to send in their photos on such topics as sustainable access to energy, energy efficiency, renewable energy, and innovation or homemade solutions devised to meet local needs. (pages 28-32): PEER, a new programme from the US Agency for International Development, offers a compelling model for bilateral science and health research with real-world impact. (pages 33-35): Brief news about honours, appointments, awards and events.